I came across a comic recently that helped me to look ahead to 2019 with some hope and more joy. 2018 was an incredibly hard year for me personally—incredibly hard—- and finding joy is something I have struggled with since losing my son in 2014. The current state of the politics in our country and the lack of compassion from people can leave a person feeling very defeated. I am an empathic person anyway so I tend to feel more than most and then take on more suffering than I should. I have turned off much of the news. I have backed away a LOT from social media and am trying to focus on taking better care of myself and, while that feels selfish, I also feel that I can only give myself what I need, as those around me seem to be doing that for themselves. Meditation has been a large part of my life since losing my son. It has helped to wake me up in ways that I had no idea. I can now look at my emotions and watch them flow through my body. That isn’t to say that I can’t still feel them and experience extreme hurt. I do. But I am learning the importance of being alone. Of going inward. Of silence. Of looking at how the selfish behavior of those around me affects how I respond. The importance of taking care of myself. The importance of letting go of expectations from others, to understand my empathic nature, and to realize I need to give myself the love and care that I can’t get from others. The realization that I AM alone and that the things I thought I had, that were precious to me, were NOT really there at all. That it is all an illusion. That the definition of some words are different to me than they are to those closest to me. But the hardest part is that I can’t change the definitions that others have in their heads even when they don’t match my own definitions. And I have let go of ANY communication to this effect as I have learned that it doesn’t do any good. Sometimes it hurts worse to hold ON than it does to let go. 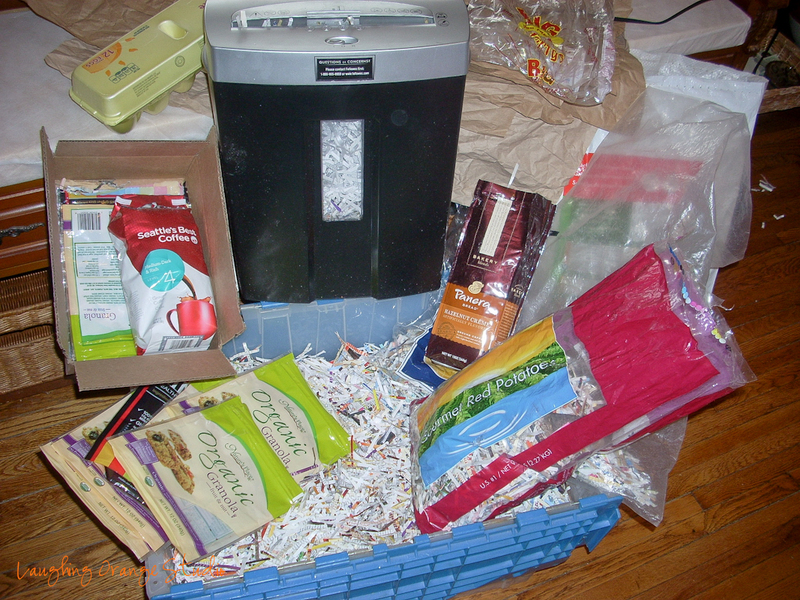 Soooooooo, I am going to take care of my own garden and am going to plant flowers. It is that time of year you know, when the seed catalogs are coming in and you dream of growing more color in the yard. Of the changes of the season going into the cold part of the year as well as the anniversary of John’s stupid death and knowing that there will be warmer days ahead. I have always wanted a greenhouse so that I can start the flowers for my garden. I have had a makeshift greenhouse for many years. The years that my emotions were healthy I have made the effort and started flats of seeds in there and filled my yard with zinnias and marigolds and vegetables that have produced enough to share with friends and neighbors. So, this year, I found a cheap greenhouse from Harbor Freight for $299. With a coupon, I spent $250 on it. There are tons of YouTube videos about how to beef up this little guy so that it will withstand the elements better. I have been watching those and today will go out and start cutting the lumber for the foundation. I’ve already ordered some seeds. My usual greens and vegetables and adding some new strawberries, because the bed I have has not been producing much the past few years. And this morning I ordered flowers. Yay! Here are a few photos and I’ll post more as it progresses. I cleared the concrete slab area of all the junk we had on it and filled in the concrete gaps that were on the slab with some quickcrete. I then took an old tent side and drew the dimensions of the greenhouse on it so that I could lay it down and get an idea of the positioning of the house. Got my work shoes on and gloves and it is supposed to get to 60 degrees today and by the weekend snow….Let’s see how much I can build today! I happened to notice that this PDF was no longer on my blog. This was created several years ago when I first had read Eliot Coleman’s book and decided that if he could grow vegetables in Maine in the winter that I could do it here in VA. I think that WordPress has upgraded their ability to handle an ISSUU document so I am pleased that it is not just a link anymore. I know that several folks have asked for this document and now I can direct them here. A couple of years ago, a friend gave me a ton of clay. Literally, a ton of clay. We know that because as Herb was unloading it out of the truck, he was doing a calculation in his head and it was more than we should’ve carried in our little truck. The repair bill later was proof of that. 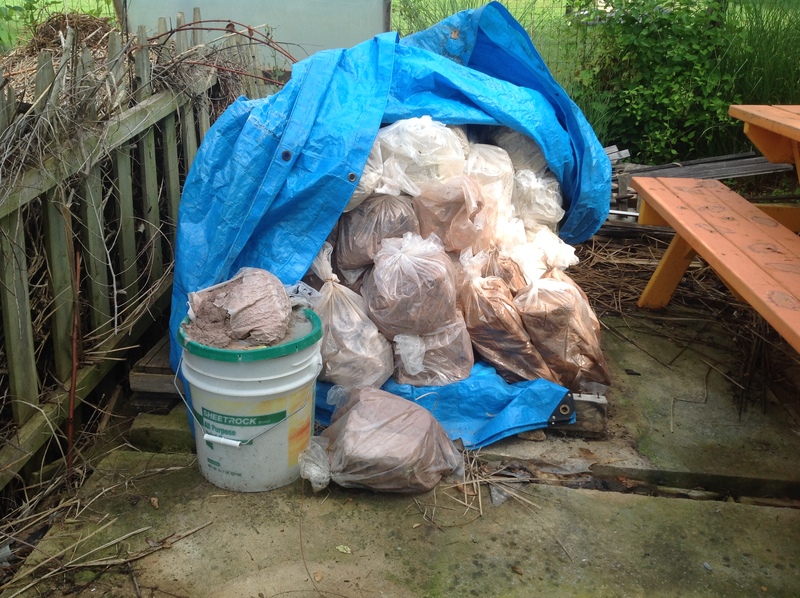 But the clay is piled up under a tarp in the back of our lot and I need to start working through the pile and using this clay. Last year, I went through the clay and made an inventory of what was there and now, looking at the list, there is a low fire terra cotta. It fires to cone 2, which is low for what I normally work in. So, I was looking at a video this morning from a homesteading family. The Dervaes Family in California who are harvesting 3 tons of food on 1/10th of an acre of land. It is pretty amazing what they have done. 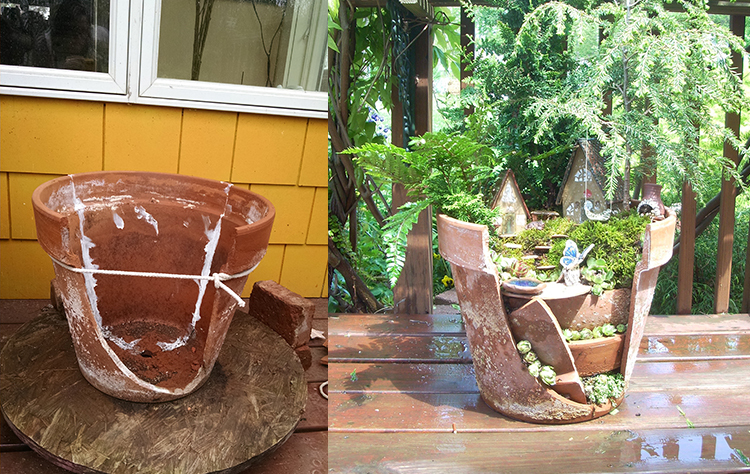 So, it occurred to me that I could make some irrigation pots like these from that terra cotta clay. 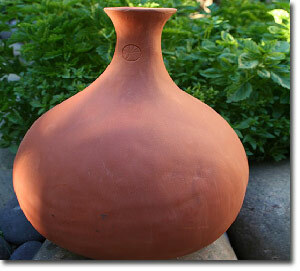 They are called Olla pots and they are a way to conserve water, which I am all about. Olla pots have been in use for many centuries and are buried in the garden. The idea is that the terra cotta clay weeps the water into the ground and allows the plants to take in the water that they need, at the roots, where they need it the most. According to Wikipedia, it is a very efficient method because very little water is lost to evaporation because the water is stored underground. 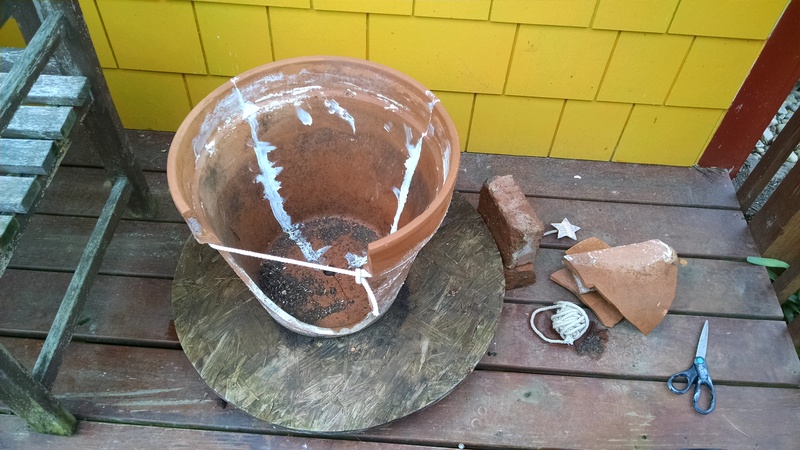 You can also see how to make your own Olla pots here at this awesome site Global Buckets whose goal is about growing food in 5 gallon buckets. Another good site that shows how they are used is Walden Labs. 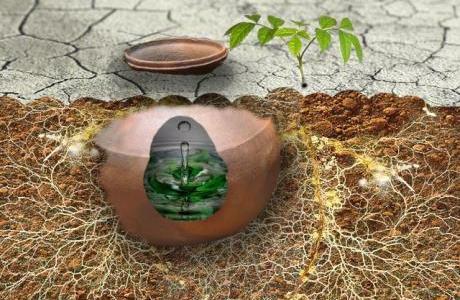 And here is a great illustration of how the pot works in the ground at this Permaculture link. or my own garden with water usage during times of drought. Now to find the clay in the pile of clay and get some water added to it so that I can start the process of making a batch of these pots. The Fairy Garden that I built 4 years ago now is starting to show some age. I don’t take it in in the winter, like I should so the freeze this past winter has broadened the cracks that are in it. So, with Blandy Farm Mother’s Day Garden Fair coming up, I need to investigate what to do with it. Each year I have replanted it. The first year it got small evergreens. The second year boxwoods. Last year, I used lavender and wood violets as you can see in the photo below. The cracks had gotten so big recently that I decided to use a silicon calk to try and glue and seal them together. The clothesline rope is to hold it together and I am not sure if that will come off or not. I will have to see how the silicon holds and how the weight of the soil going back in helps to keep it together. This image has been viewed thousands of times on the web. 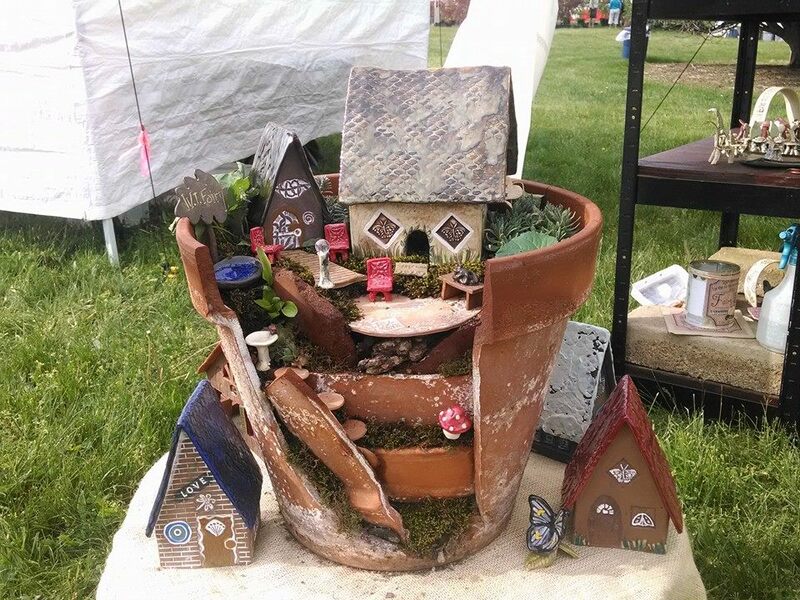 It is one of the gardens that shows up if you do a google search for fairy gardens in broken planters and many people have posted it, without my permission, as an example of how to build a fairy garden in broken planters. I have reached a point that when I come across one of these links on Pinterst or on Facebook, I just thank them for the free advertising and put a link to my Etsy shop. Currently, I don’t have enough of the items to put the kit as a listing but I will have enough soon. This was the second year with part of the evergreens and a boxwood off to the side. Then last year, I added some small lavender and a much larger house. So, now I am at this stage of rebuilding. 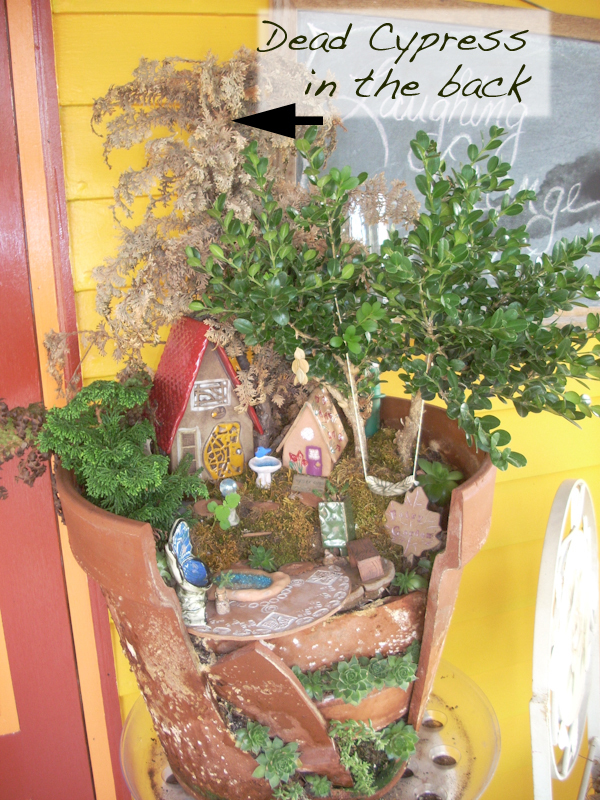 What will the fairy garden look like in a few weeks? You will just have to wait and see. I wish I could get my hands on miniature lettuces and onions. I may have to make a batch of ceramic vegetables and put in a mini garden for the summer. Claudia came to visit me this week from New Hampshire and recently, she had read a book by Joel Salatin called, “Folks, This Ain’t Normal”. I remember reading about Polyface Farm in Michael Pollan’s book Omnivores Dilemma. So, when Claudia wanted to try and go and visit this farm, I was excited to take her there. We got up early and headed south on I 81 to Staunton and followed the directions that took us way out into beautiful valley farmland. It was incredibly picturesque and the farms were large and connected by beautiful fields of green, some of them dotted with hay rolls, some of them clearly growing corn, probably for Monsanto and some of them had housing that was probably full of hens and chickens that would be trucked to a processing plant nearby. When we arrived at Polyface, however, you quickly got a very different picture as to how farming is all about a balance of lots of processes and not just one specific crop. On some days, Joel or his son are available to talk about how they run their farm and you can have some personal time with him to ask questions. But the farm is open every day and that if they aren’t available, you are welcome to come and walk around the property and see everything they are doing on your own. When we drove up, as luck would have it, Joel was giving an interview on the picnic table with a film crew in the front of the house and he motioned us to come on around. We found a place to park and walked around the property and didn’t want to interrupt their interview. As we traveled down I-81, I told Claudia that I hoped that we wouldn’t get there and it be the day that they are slaughtering the chickens because I wasn’t sure I could watch them do that. I truly believe that if more of us were to SEE how our food is processed, we would all change our minds about some of the items that we eat. Also, as luck would have it, they WERE slaughtering chickens and that is the first thing we saw and heard when we got out of the car. I did manage to get my nerve up and take some photos so beware when you look, you may want to skip over those in the photo album that I am attaching. Beside the place we parked the car were some greenhouses full of lettuces and tomato plants. The first thing that struck me was the fact that there were rabbit hutches in the greenhouse lining one of the walls. Clearly, the rabbits were adding the fertilizer to the greenhouse floor and this could easily be racked from underneath over to the plants so they could benefit from this nutrient. The second thing that I noticed was the fact that they were heating this greenhouse with a wood heater. I’m not sure how this actually worked but it was situated in the corner and had a chimney coming out the front of the greenhouse. The tomatoes were tied to the ceiling of the greenhouse and were just beautiful! The second greenhouse was full of lettuces and greens. Again, it had the empty rabbit hutches lining one of the walls for fertilizer. This one wasn’t heated and I’m sure that, just like my cold frames, these lettuces did fine for them in the cold. The lettuces were close to bolting but were still very much edible. Next, we walked to a chicken house that had some baby chickens that were about 2-3 weeks old. The chickens on the farm are clearly at different stages of development and, if you have read Omnivores Delimma, then you are aware of Joel’s technique of moving the animals around on the farm so as to get the full use of the animal while it is in connection with the land. These chicks were big enough to be graduating to the next stage and we were able to see them load them up into crates so that they could be taken up onto another part of the farm where they would live for another phase of their lives, fertilizing the land underneath their feet and getting fattened up on the natural elements that are inside their cages. As we walked up the hill we encountered that next phase with larger chickens out in a field. The coups were scattered about on the hillside and as you walk you can see the squares where, clearly, the coups had been in the previous days. In addition to seeing the vegetation that had been fertilized with the chicken manure, you can see that recently there had been cattle in the same area because there was the occasional dried cow pattie that the chickens had been eating the grubs out of, essentially eating what, if left alone, would hatch out as large black flies that would be a serious nuisance. The chickens love the grubs and at the same time they are eliminating something that would make the cows very unhappy and possibly sick. So, we continued our walk on up the hill and found the turkeys. They had their own pen and had a turkey tractor so they could also be moved after they had done their bit in making that section of the farm fertile. They also have a roosting shelter. This pen also has an electric fence to protect them at night so that foxes or other predators don’t come in and get them. and according to Claudia, in Joel’s new book, he says he hasn’t really figured out how to add the rabbits into the field scenario but they do have them for their meat. So before we left, we went in to the shop that they have on the property, where you can purchase the meats that are grown on the farm and Claudia bought us one of the hens from the freezer case and some of the sausages. She bought a souvenir shirt for her hubby and while we were in the shop, Joel came in and she was able to meet him, ask him a few questions and tell him that she had read his latest book. While she was checking out, I managed to get my courage up and go around the side of the building where they were still slaughtering the hens and take a few photos. I think we had a great day at the farm and got to see some of the techniques that I’m sure, as Joel leaves his farm and drives out to civilization, he wishes he could stop along the way and teach the farmers that he passes, how to better care for the land that they are tending and to better care for our planet as a whole.